chiming in 1974. The bells had not been rung on wheels since before WWII, the fittings had much deteriorated, the frame was of poor design and construction; and the bells much indented. 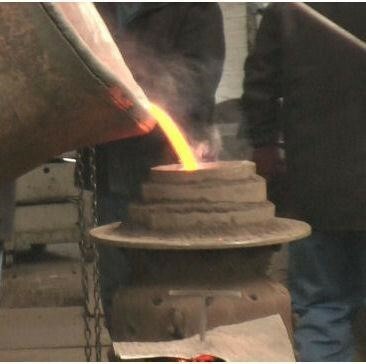 In mid 2008 Ian Kerwin and Peter Tottman saw the state of the bells and frame. Ian, a bell ringer and qualified as a carpenter, and Peter, having an interest in woodworking, conceived of the project to restore the bells. The restoration project had two key principles – as far as practicable, the work would adopt traditional materials and techniques and, secondly, work would be carried out by the community. The bells were augmented to a ring if six by the addition of a new treble and the adoption a bell formerly hung in St. Mary’s, Prittlewell as the second. The original four and the one from St. Mary’s were fully overhauled by Whitechapel Bell Foundry and fitted to new timber headstocks, all retain their canons. 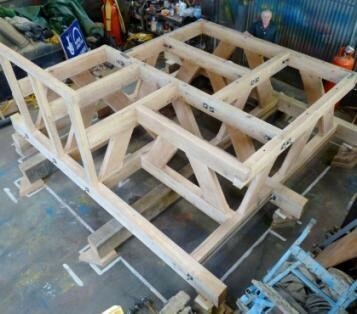 The new bellframe was designed by Whitechapel and constructed in European Oak. Both frame and the wheels were made by volunteers here in Willingale. Almost all work in the tower, including the lowering and raising of the bells, was carried by volunteers. The project exemplifies the strong self-help attitude and community spirit of this parish and the participants enjoyed working together. The May sun shone, the bells rang out. No fears here of casting clout. In majesty, the Tower stood proudly Excited whispers, inside, spoken loudly. No ordinary day to salute the Team, Honouring its achievements in high esteem. We stood, we sang, we suppressed a tear. We sat, we blessed, anxious to hear. Pride shone through on the faces of they Whose efforts now on open display. From now on, we will see them ringing. On high, they will hear us singing. The time had come – the new peal was rung. Heads turned upwards – praises sung. Emotions ran deeper than we thought At no price whatever could this be bought. Spontaneous applause heralded the crew. Its skills and devotion so clearly in view. The bells, they beckoned, “Come and try us” Their future secured to enrich and inspire us. The visitors and villagers leaving the fray. Smiling, moved and touched to the core – Willingale’s bells ringing, for evermore. The project cost £70,000. The PCC and the bell ringers express their thanks to all who have supported financially or in kind. The bells were dedicated on the 27 May 2012 and rung to celebrate Queen Elizabeth II’s Diamond Jubilee on 2 June 2012. 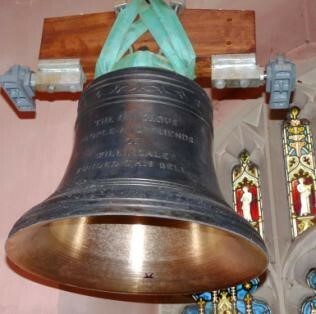 In 2015 the 1634 John Clifton fourth, that was irremediably oddstruck, was replaced by a bell from Christ Church, Bath that was tuned and set up by Matthew Higby. The 1634 bell is now the service bell.